The duo of James Laurence and Dylan Reznick, aka Friendzone, initially came into prominence in 2011, having made waves in the blogosphere with production for Bay Area cloud rappers Main Attrakionz - these two tracks, "Perfect Skies" and "Chuch", would later be released as instrumentals on Collection 1 (one of my favourite mixtapes of 2012). 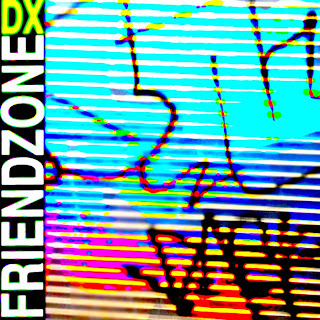 2013 has proved to be another stellar year for Friendzone, with production credits for the likes of A$AP Rocky and Mykki Blanco and their own Kuchiburi Network 3 mix, and they've capped it off fantastically with DX, their first proper "album". The day-glo cover art sets the tone rather nicely; DX creates an intimate headspace almost immediately with opener "Taswell", wherein a string sample is chopped, looped and paired with a booming beat, before heavy synths and fragmented vocals are bought to the fold. Such is the energy of Friendzone's sound that they can morph an Aphex Twin ambient work into an upbeat, dynamic banger on "RetailXtal" and fuse melancholic piano loops with cloud beats on "8AM", all while retaining their own distinctive style. In an increasingly homogenised world of hip-hop producers, the density of DX's production carries a lot of weight, and in a way, this is Friendzone's Donuts or Cosmogramma; it acknowledges its hip-hop and rap roots, but it never needs an MC to carry itself forward. 2013 is the year we take friendzone back from the bros"
If this was their mission statement for the calendar year, DX signifies the accomplishment of said mission. It's not only a love letter to the cloud rap scene they heavily contributed to, but it's also an indicator of where they're at this juncture and where they're going to take their sound in the future, and as such they've transcended the unfortunate connotations of their chosen moniker to become a powerful force in their own right.